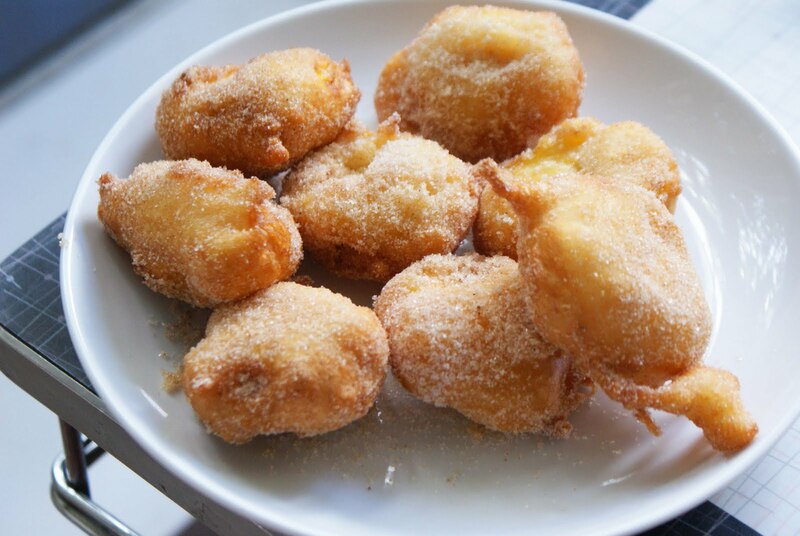 Plantain fritters! I wish I would have figured this out on Monday. Then again, best that I didn’t – the house smelled like mini donuts and the Stampede all day. They were fantastic. And easy to make. They brought out the banananess of the plantains – as fritters, they tasted more of bananas than I think bananas would have. And they held up to the heat – when you bit into one, it wasn’t mush. I love that this week I was forced to make my acquaintance with something that has been available to me for most of my life, and yet I never bothered getting to know. I still have enough left to take a stab at a curry next week. Which, ahem, brings me to a small confession. I assumed that since we started on Monday, Sunday night we’d be wrapping up the project. It makes sense, doesn’t it? But then en route to CharCut last night, where I had booked a seat at their communal table for Meat Sundays, at which this particular Sunday they promised to make a 15 kg poutine, I got an email titled: three more meals and you’re home free! At any rate. I didn’t bail out on going for poutine, since I had already signed up. We went. And yes, I enjoyed it. It was good food with good friends around a table of happy (verging on ecstatic) people. It was nice to see cheese again, but I had been eating my share of potatoes this week anyway. And really, I haven’t had my eye on the finishing line throughout this project, because that’s not the point. Yes, it wraps up today, but I can’t say I’m excitedly looking forward to dinner (to sum up the gist of the aforementioned email: I imagine many of you are looking forward to dinner tomorrow when you can eat whatever you want! That’s right after your lunch tomorrow you are all free of the Hampers!) because really, all of the participants in this were always free of the hampers. We’re not homeless, nor struggling. We didn’t worry all week that we can only access the food bank once per month, and what we might do when this stash runs out. This has been a learning experience, but I still can’t say I know how a food bank client feels, or that I’ve truly walked a mile in their shoes. Some participants have said this week was fun, but I doubt anyone actually utilizing the food bank would share that sentiment. So. I won’t be going out for a celebratory dinner tonight. I’ll use up the rest of my hamper, along with the (comparably vast quantities of) ingredients already in my kitchen. I’ve already gone and bought a couple bags of food to give back to the food bank (remember-Husky covered the cost of the extra food for all our hampers). I’m going to continue on in some way, cutting my food spending drastically – for the next month at least only buying fresh produce and milk. (And toilet paper. Hard to make that from scratch.) I’m going to shop from my cupboards instead of from the store, and make do with what I have, which is clearly not that difficult. I’ll try to pursue new sources of fresh produce for the food bank wherever I can (a portion of the new Ramsay community garden? ), and contribute easy recipes (hopefully even compile a cookbook) because that’s what I can do to help. And I’ll focus more energy on being happy for what I have and less thinking about what I’m in the mood for. And I’ll definitely eat more plantain fritters. Thanks to Gourmet for walking me through this. In a large bowl, whisk together the flour, sugar, baking powder and salt. Add the water and egg and whisk until the batter is smooth. Peel plantains and cut on a slight diagonal into 1/2-inch pieces. Heat a half inch of oil in a heavy skillet or pot until hot, but not smoking. Dip the plantains in the batter to coat them and fry in batches (don’t crowd them) until bottoms are golden, about 45 seconds, then turn over and fry until other side of each is golden, 30 to 45 seconds more. Transfer to paper towels to drain. Stir together the sugar and cinnamon in a shallow bowl. 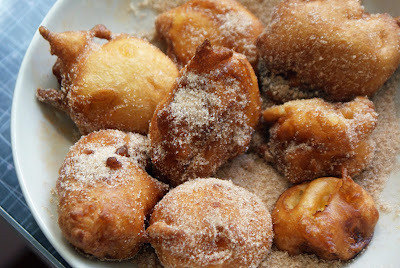 While still warm, toss each batch in sugar mixture until coated. Serve warm. Sigh, you raise a good point. This challenge was “fun” for Tim and I because it was just that – a challenge. At any point I could use my debit card to buy any food I wished, and I had cupboards full of other food I could eat and enjoy. While our grocery shopping habits won’t change as we do use quite basic ingredients, I will definitely be more aware of money spent at restaurants. If Tim and I go for a nice dinner we would spend about $120.00. We used to go out every other week or so, and then one day it dawned on me – that $120.00 was a full weeks worth of groceries. Needless to say, we don’t go for dinner anymore. We will continue to use the ingredients from our hamper in our meals and will continue to find extravagance in the simplest of ingredients. Your plantain fritters look amazing, we still have a few plantains and I will most definitely be making some!